HG » Legend of Edda » General Chat » Do u feel about rerolling ur main ? So here the solution : what about we make a reroll with same class as our main ? if everyone's willing to make new characters for the 2nd SD run, that would be cool. Yeah, I already started leveling an Archer for when I get my full set, but by the looks of it, won't be for a long time since Bow doesn't want to drop. We apologize for the servers being offline. We have identified the issue and the servers are back up! We will announce a compensation package for all Edda-ers shortly. +200% EXP Rate - Increase in EXP earned from killing monsters. +200% Drop Rate - Increase inDrop Rate of items from killing monsters. +200% God Points - Increase in God Points from killing other players. +200% Money Rate - Increase in Gold earned from killing monsters. Rates will begin Saturday, January 1st. Thank you for your continued support. If you are still experiencing any problems, please submit a DQA. No Joke ! If u want lvl up a reroll : it's right now or never : 200% exp until when ? im ok with this idea. Greetings to all citizens of Gaia! The time has come for another weekly event to bring in the new year with Double Up Weekends! Get ready to grind as this week the gods have granted all players 200% EXP! This event will run from 1/7 through 1/9. Legend of Edda Staff want to stop soon the 200% exp event : so lvl up ur reroll right now b4 the event end ! "Greetings to all citizens of Gaia! The time has come for another weekly event to bring in the new year with Double Up Weekends! Get ready to grind as this week the gods have granted all players 200% Drop Rate! This event will run from 1/7 through 1/9." 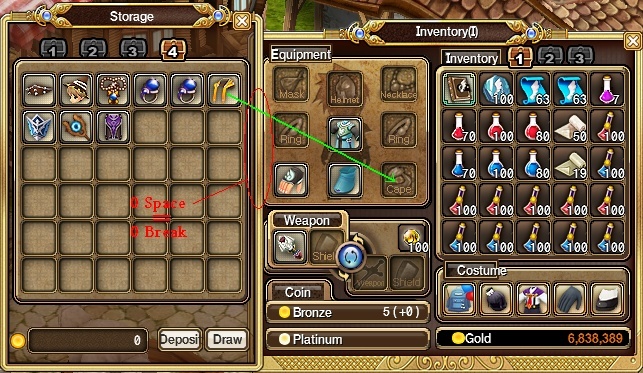 U just have to remove all space between ur warhouse storage and ur inventory ! Thank you for your inquiry. We apologize but we decided at the last second that we change it to increase drop rate instead. Not to worry, as this is a weekly event and there should be an EXP event in the near future. We apologize for the inconvenience and we appreciate your support. Please feel free to contact us if you have any further questions or concerns. We apologize for the servers being down and we will have them back up shortly. Thank you for your patience and support. We will announce compensation shortly. Thank you for your patience! The servers are now back up and we have increased all rates as compensation until this Friday 1/14/11 PST. +50% EXP Rate - Increases EXP earned from killing monsters. +50% Drop Rate - Increases Drop Rate of items from killing monsters. +50% God Points - Increases God Points from killing other players. +50% Money Rate - Increases Money Rate from killing monsters. Rates will begin Wednesday, January 12th. Thank you all for your continual support. If you are still experiencing any problems, please submit a DQA. Here is the Exp bonus ! Enjoy the end of this week with Double Up Weekends! The gods feel very generous this weekend and have granted all players 200% Drop Rate and 200% EXP! This event will run from 1/14 through 1/16." 15 Re: Do u feel about rerolling ur main ?